When it comes to setting up learning centers in a preschool classroom, there are so many great ideas out there. 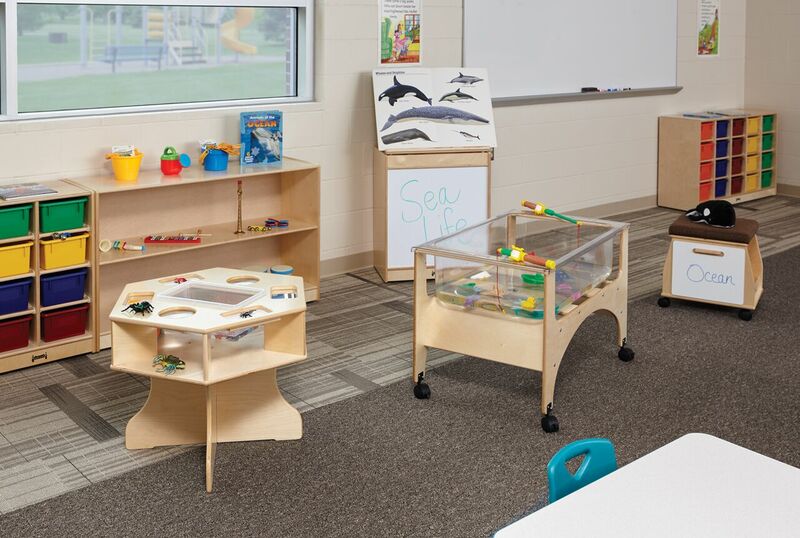 Figuring out what is the best use of your space can be quite a challenge, but it is important to choose a few great centers that can be spread out around the classroom, rather than cramming too many centers into your limited space. Although narrowing down the options may be rough, there are a number of choices that are important for any classroom. Here we present four essential learning centers, which help promote proper development through fun, hands-on activities. What belongs in an imaginative play area? Pretend play is one of the hallmarks of a preschool classroom, so you want to make sure you set aside the resources needed to make this center exceptional. Most imaginative play areas include a play kitchen with some utensils and food, some kind of seating area such as a table or some child-size couches, and lots of dress-up clothes. You don’t necessarily need expensive costumes, you can often just fill a bin with some fun used clothing, bags and hats. Kids just love acting out scenarios which relate to their lives. And it’s not all fun and games, this learning center also helps students explore social and emotional aspects of life, and learn to think about things from other people’s perspectives. What other learning centers belong in the classroom? A fine motor center is a great idea for every early-childhood learning space. This is a center which is constantly evolving, the materials should be switched every week or so. In a fine motor center, students are given engaging activities such as picking up and sorting small items using tongs, or clipping a certain number of clothespins onto a bucket. The work they do in this station helps them develop essential life skills, as well as preparing them for many tasks that they will need to perform in school. Why should preschoolers play with sand and rice? What was once a tub full of sand is now called a sensory exploration center. This is a place where young learners can investigate all kinds of different materials. They can explore the texture of sand, water or rice by using all types of shovels spoons and containers. Teachers can hide little treasures in sand or rice and challenge the students to dig them out. The flexible nature of sand, with no clear rules or instructions, encourages students to innovate, collaborate and explore. The same is true for rice, water and many other types of materials. It’s important to ensure that the sensory exploration center has all kinds of different tools, because there is no way to predict the unique ways that students will think of for playing and creating with these materials. What belongs in a reading center besides books? Although the reading center is possibly one of the most obvious learning centers in a preschool classroom, it is still worth mentioning. With all of the classrooms that are now focusing on device-based learning, it is important to remember that print books are important as well. A reading center is more than just one bookshelf, it is a comfortable and inviting space where students can enjoy some quiet time with a book. Even before they can read, kids still enjoy looking at the pictures and picking out some letters or even words that they have learned by sight. Teachers can also choose a featured book (or even a few), and include a headset which plays a recording of someone reading the book, so students can follow along. If you are setting up a preschool, having learning centers in the classroom is extremely important. Little ones need to explore in order to learn about the world around them and develop life skills. Centers encourage students to try new things, while building important life skills. There are so many great ideas out there, but by starting with these four super centers, your classroom will definitely be supporting students as they develop.